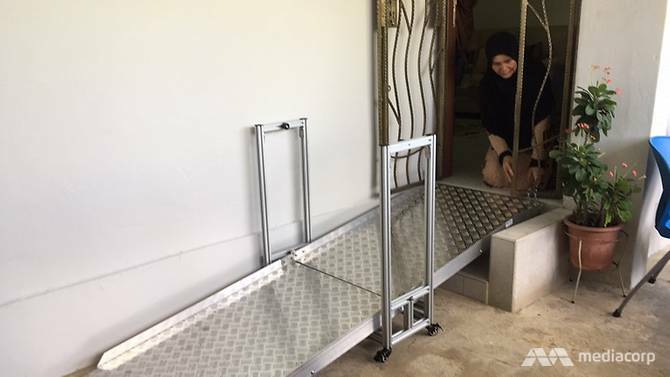 The Housing and Development Board (HDB) will soon offer wheelchair ramps for seniors who live in flats that have steps at their entrances under its Enhancement for Active Seniors (EASE) programme. Owners of flats with a multi-step entrance or entrance with two to four steps can opt to install the ramps for wheelchair-bound seniors, HDB said on Saturday (Apr 28). There will be two types of ramps – a portable ramp or a customised fixed ramp, depending on the suitability of the flat. For flats where neither ramps are suitable, mechanical wheelchair lifts can be installed under a separate pilot scheme. However, these lifters will be costlier and require regular maintenance, said HDB.